It is a 70th memorial day of HIROSHIMA today. I heard a radio that told about HIROSHIMA. Everybody is proud of military in the US. When I have played martial music with orchestra, military stood up and took their hands on chest. Around people clapped their hands during we were playing! It was surprising. The martial musics are very cool. People are proud if one of their family is military. I listened martial music by winds orchestra on July 4th. I don't feel like being proud of military. Is that because I am Japanese? 'On that day(8/6/1945) alone, at least 70,000 people' in the US. But the number of people who have been killed by atomic bomb in Hiroshima is 297,684. It is not only on that day. After the atomic bomb,many Hibakusha have been killed because of radiation exposure. I remembered the book 'KUROI AME' which described HIROSHIMA by Masuji Ibuse today. The DVD 'Massage from Hiroshima' was released on this August in the US. 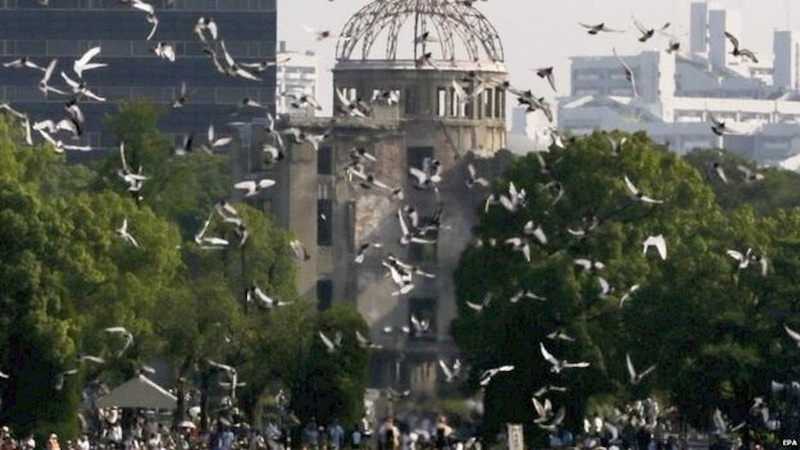 Doves were released over the Atomic Bomb Dome during the peace memorial ceremony.